Description: The first beta test of League of Angels Cross Server Tournament will start on March 8th in US East Servers between 1 and 40. Elite warriors of each server will have a chance to compete for the championship of all servers in the one-week tournament. The prizes include Victoriana's Icon, Lvl. 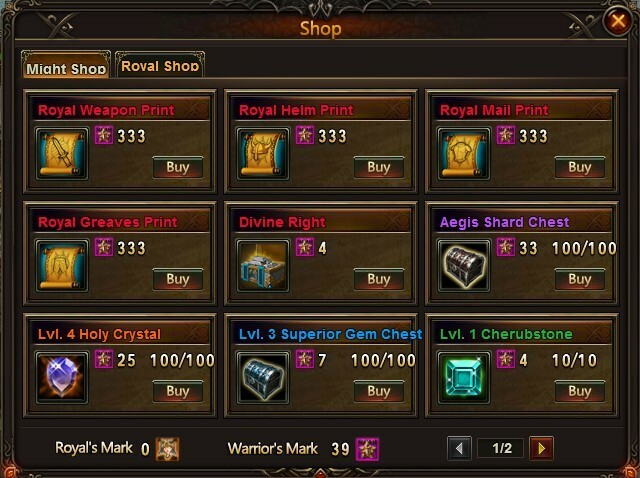 60 Mythic Equipment Print, special Flair, Prestige, Gold, etc. * For rules and details regarding Cross server Tournament gameplay, please check the introduction below. * Cross-server Tournament availability on US West servers will be postponed until more US West servers are opened. Description: As this is the first beta test of Cross Server Tournament, there might be bugs and glitches during the competition. If you find any bugs, please report them to us in the forum to help us improve the tournament. For each valid bug, we will reward the reporters with Vouchers ranging from 100 to 300 according to the severity of the bug. For details, please click here. Description: The 100 players with the highest group stage points will be selected to participate in the final tournament on March 21st. Who do you think will make it to the Top 100? Time to show your support for your favorite candidate on our forums! Click here to learn the details. Description: The 100 players with the highest group stage points will be selected to participate in the final tournament on March 21st. Who do you think will make it to the Top 10? Place your wagers and win Vouchers. Click here to learn the details.